I was doing some research into business-cycle lengths in Britain and the US, and came across a couple of interesting charts. Global stock markets are behaving in a unique way, where we are seeing a curious degree of volatility of volatility. Simply put, the measures of market volatility have themselves become curiously volatile - we have these quiet spells of very low volatility, interrupted by frentic portfolio rebalancing and sector allocation shifts. Viewing the market as a deterministic but chaotic process, which creates fractal price and return series is nothing new, but the massive monetary expansion that has taken place since 2009 - without generating significant inflation - is a rather new phenomenon. I lean toward using ecology models to understand the process. Perhaps we are seeing a wealth dieback that still is balancing the monetary expansion, and this could perhaps partly explain the below-target inflation rates that many western countries (Japan, US, Britain, Canada, Germany... etc.) are experiencing. The low level of interest rates means savers and low-risk investors in all these countries are experiencing significant income reductions, which has to be affecting overall consumption. Demographics also is a factor. Risk-aversion naturally rises with age, so despite the low returns, government bonds remain attractive investment vehicles for the portion of the demographic that is growing fastest, especially in Japan, which now foists negative interest rate bonds on its aging investors who are trying to protect their shrinking pools of capital. The pension funds and large insurance pools are also facing a Hobson's Choice of investment options for the fixed-income, low-risk portion of their portfolios. We all know about the monetary expansion. Below is a graph of M1 (Narrowly defined weekly money supply) for the US, for the period from 1975 to 2016. 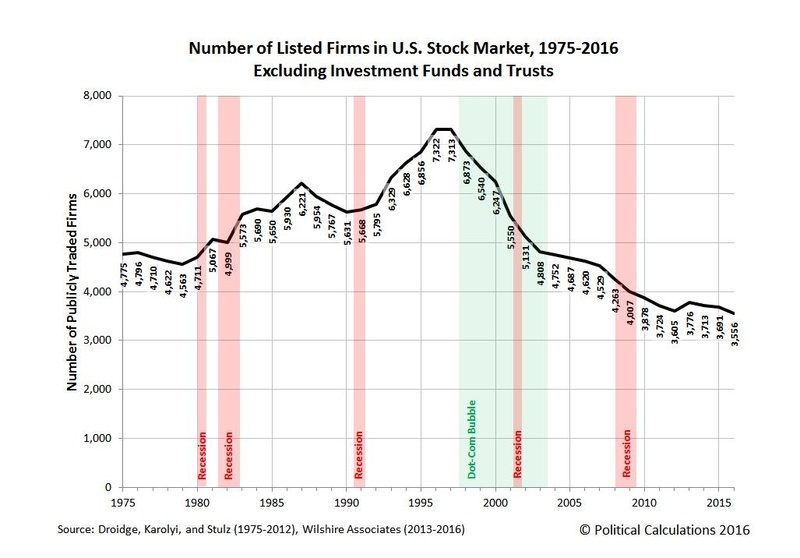 But below that, I found a chart showing an interesting series - the number of firms that are listed on US stock exchanges. There is no size or valuation data implied, just the raw number of listed public companies. And to my surprise, it has almost fallen in *half* since the days of the dot-com bubble. There is no question that a real die-back has taken place. And perhaps it may continue. But with the expanding money supply, and the absolute reduction in the range of viable investment choices, stocks will have to be bid up. Only an idiot or a very sophisticated, multiply-hedged speculator wants to own zero or negative interest bonds, so most of the fixed-income market is just a no-go zone, unless you are legally required to buy that stuff. I seriously doubt that M1 growth will run in reverse. More likely, it will begin to plateau. But at some point, another (and possibly rather big) bubble will begin in the US stock market. My research (and that of many others) suggests that the maximum business cycle length is about 8 years. At least, the economic variables that drive output don't have "memory" in their series beyond 8 years. So our systemic *memory* of the 2008-2009 financial crisis meltdown is beginning to decay. Look at the second chart. With money supply shooting to the moon, and all bonds being an awful bet going forward (either as zero-return entities, or worse, capital-killers, as rates begin to rise), the only game in town (ie. planet Earth), is the stock market. There could be two or three *thousand* new IPO's in the US, and we would still not eclipse the previous number of listed firms. And an increased rate of new IPO's are associated with a rising market. I'm not asserting any causality vector here - just suggesting that by historical levels, the stock market is pretty quiet. It's job is to channel private savings into profitable public firms. A 7 percent growth rate in prices each year, for the next 5 years, would take the Dow Jones Industrial average well above 25,000. Current valuations based on earnings suggest this would be a bit heroic, but it is only a 40% advance, over 5 years. The Dow Jones Industrial average moved from a low of 30.8 in the autumn of 1903, to over 75.4 by January of 1906, and then fell back to 38.9 by November 1907, only to rise again to over 73.6, by November 1909. By August 1921, the DJIA was 63.9, and by September 1929, it was 381.17, a rise of almost 496%. By July 1932, the DJIA was at 41.22, and by March 1937, it had reached 194.40, a 472% gain, during a time of widespread economic depression. A 40% advance over the next five years, during a time when borrowing costs are as low as they have ever been in recorded history, does not seem at all extreme or outlandish, given the fractal nature of the DJIA time series, and the known stimulative power of low-priced credit. I am not saying a massive stock market bubble *will* happen. But it looks quite possible that a rather significant stock-market boom *could* happen. Given wide-spread equity holdings by US investors (Many ordinary Americans hold stocks directly), it would also be a good way to "helicopter" some of that monetary bloat into the wallets of ordinary consumers. Say's Law ("Supply creates its own Demand"), does not always hold. If you want to stimulate consumption, it really helps to get hard-money into the hands of folks who want to buy stuff. A fat dividend cheque, or a nice cash-out of a triple-bagger, is a fine and effective way of doing that. Oh, and one more chart. We all know that short term rises in interest rates can be used to damp down economic activity. But if you look at the long sweep of history, in both the USA and the UK, you can see that the nominal level of short and long rates tends to correlate with stock prices. This is not surprising, as rising rates generally accompany improving economic conditions, and low rates are a policy response to economic downturns. What is perhaps forgotten is the basic premise of a market economy that has self-financing agents that engage in financial transactions. Investors need to have a return, and rising rates of return on capital are generally associated with improving economic conditions. Going forward, over the next 5 to 10 years, we should not be surprised to see gently rising interest rates associated with a gently rising stock market, as this is what a properly functioning (and a not-so-properly functioning!) financial market economy looks like. See the interesting chart I lifted from Ken Fisher's old book "The Wall Street Waltz". The data covers the period from 1919 to 1978, and was sourced from "The Bank Credit Analyst". Note that it shows how rising commerical paper rates can knock the market down, but that also (eg. 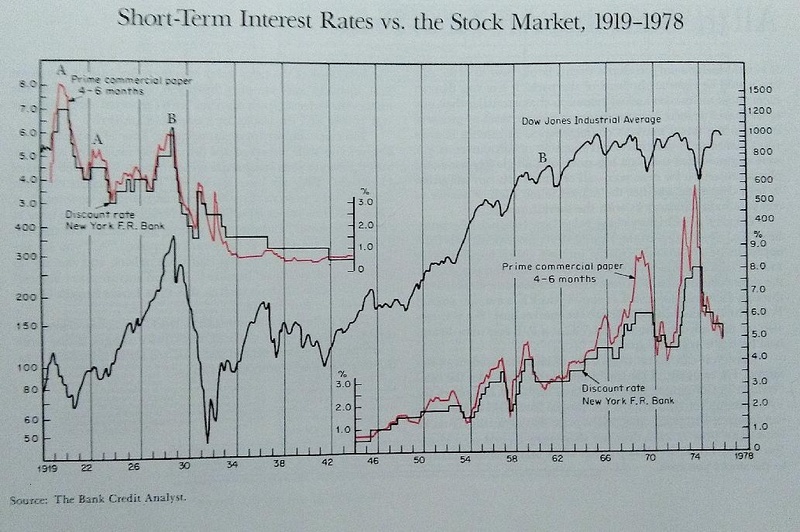 1924 to 1929, or 1947 forward), rising interest rates have accompanied a rising stock market. Folks should not be surprised by this. And a recent article from the St. Louis Federal Reserve, by Stephen Williamson, has highlighted what I have suggested in this note - the positive relationship between interest rates and inflation. The historical evidence since 1954 to 2015 in the USA is documented in the scatterplot, with associated regression line, from the St. Louis Federal Reserve research note. 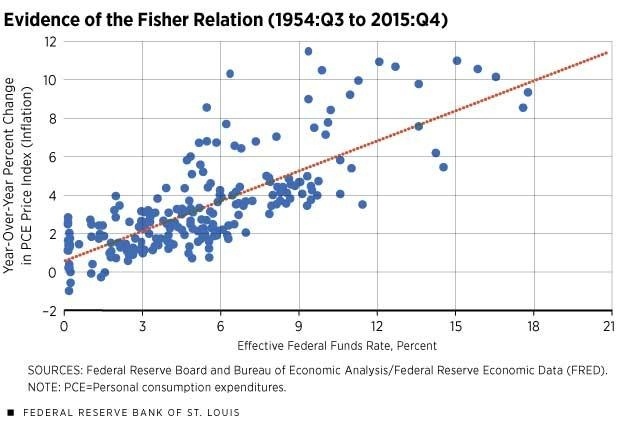 This relationship was described by economist Irving Fisher, hence the name "Fisher Relation" for the chart. Oh, and full disclosure: Both personally, and for the portfolios I manage, we are fully invested in equities, long positions only.